Teen Vogue is getting ready for their seventh annual Fashion University in New York City from October 19-21, 2012 and they’ve already got a great list of speakers lined up! Fashion University is a weekend of seminars and workshop attended by fashion students from around the world, and always features some of the industry’s most prominent players. This year’s confirmed guests (so far) include: Andrea Lieberman of A.L.C., Bryan Boy, Danielle and Jodi Snyder of DANNIJO, Prabal Gurung, Rachel Roy, Max Osterweis and Erin Beatty of SUNO, Olivier Theyskens, Peter Som, Nicole Richie, and Pamela Love. That’s a lot of heavy hitters for one weekend! 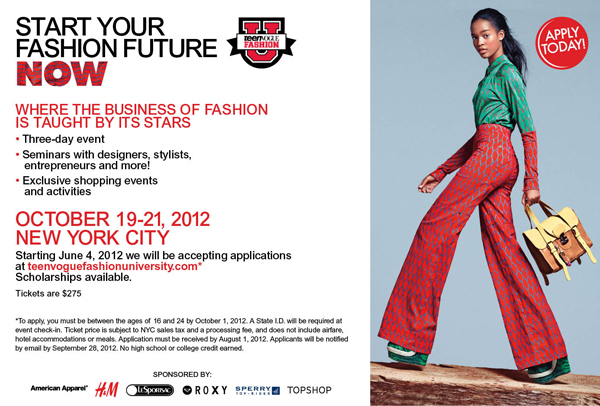 Read more about Teen Vogue Fashion University and apply here – all applications are due by August 1, 2012.